For as long as I’ve been reviewing Microsoft Word, it has been difficult to see any kind of relationship between Word for Mac and Word for Windows, beyond the name and file format. They were essentially two completely different products designed for what, in Microsoft’s mind, were two completely different sets of users. 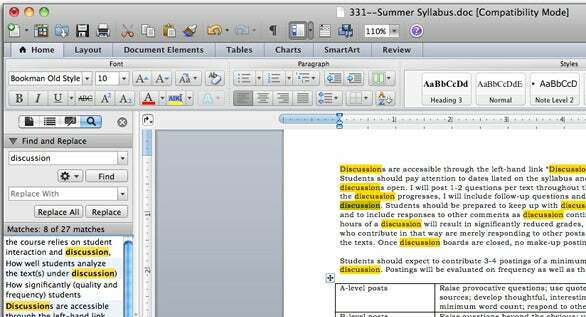 Word for Mac 2011 changes all that. The Intel-only Word 2011 is a significant and substantive update to Microsoft’s flagship Mac word processing and page-layout application. It is an update that unifies a user’s experience across platforms, and it’s also a release that contains many valuable new features and improvements—more than 30 in all. The bottom line is this: Microsoft Word for Mac no longer feels like a second-string word processing program in the Microsoft Office suite. It is in fact a powerful tool for creating all your personal and business documents and for collaborating with others. More importantly, Word 2011 now makes it possible to insert a Mac into nearly any business environment and offer Mac users the same set of features found in Word for Windows, without compromise. Word 2011 has the same look and feel as Word for Windows, but is in many ways more refined and better organized than its Windows sibling. Word 2008 ( ) used the combination of a nearly useless Elements Gallery that appeared at the top of every document and a floating Toolbox to provide you with formatting tools for your document. Word 2011 has the Ribbon, an intelligent, customizable toolbar that provides you with a set of formatting tools suited to your current task. Working on a word processing document? The Ribbon displays a set of text formatting tools. Adding a table or a chart? You’ll find a complete set of tools for editing and formatting the same. Inserting an image into a document? The Ribbon contains everything you need to resize, color correct, wrap text around, or otherwise format that image. If you'd rather not use the Ribbon, you can hide it. While initially the Ribbon may seem daunting to master, in practice I found that I wasn’t wasting time looking for the tools I needed to get my work done. And because you’re able to hide the Ribbon, you can get it out of the way when all you want to work with are words. King of the Word: Word’s new UI unifies the interface between Mac and Windows versions and offers Spotlight-like find and replace tools. Word 2011 has significantly improved collaboration tools, making it obvious that Microsoft now considers Word for Mac, and thereby the Mac itself, to be an enterprise-level work tool. Word 2011 includes support for Microsoft SharePoint, SkyDrive, simultaneous document editing, the option to communicate with others while you edit documents together, and improves the control you have over the kinds of rights users have to review and edit documents. This security feature requires that you use Microsoft’s Information Rights Management (IRM) tools, which also means that you’ll need a volume license edition of Office 2011 and a Microsoft Rights Management server, but the upside is that you’ll have much finer control over what other users can do with the documents you create. This includes setting expiration dates for documents and controlling whether the contents of a document can be printed, edited, or copied. Additionally, if you save your documents to Microsoft’s SkyDrive, or if your business is using SharePoint Foundation for 2010 Enterprise, you have access to the Word Web App. So by using any supported Web browser (Safari, Firefox, and Internet Explorer), you can access and edit your documents via the Web. I could view documents on an iPad, but I could not use the Word Web App to edit them, at least not at this point in time. The World Wide Web edit: Using Microsoft’s free SkyDrive you can save documents to the cloud and edit them by using the Word Web App. If you’re accustomed to using Word to create not only basic word processing documents, but also the brochures, menus, meeting minutes, calendars, proposals, and posters you use to do business, Word 2011 offers a large collection of professionally designed templates, as well as many more that are created by and shared with other Office users. While I still don’t find Word’s Publishing Layout tools to be as easy or intuitive to use as those offered in Apple’s Pages '09 ( ), when it comes to wholesale customization of these templates, Word has some distinct advantages over Pages. At the top of that list is Microsoft’s Themes. Themes, which you can use with both word processing and desktop publishing documents, take advantage of the Styles used in a document, allowing you to make instantaneous changes to fonts, paragraphs, colors, and other layout elements simply by selecting a new theme. Word 2011 ships with over 50 layout themes, but you can also create custom themes to turn a generic Word template into something that’s unique to you and your business. Word 2011 now has a built-in equation editor that makes it easy to add and edit mathematics equations. The equation editor, which appears as an Equation Tools Ribbon when you add an equation to your document, gives Word a leg up on Pages, which requires that you buy MathType for the same functionality. Word 2011 has a few other welcomed improvements and additions. Office 2011 also marks the reintroduction of Visual Basic for Applications, which means that Word is no longer limited to Automator and AppleScript for automation. There’s better organization of the tools you use to manage footnotes, endnotes, and bibliographies, and a new customizable, distraction-free full screen mode. This full screen mode is similar to what you’ll find in Pages or other word processors like Hog Bay Software’s WriteRoom ( ). While the differences between these modes in these different applications is negligible, Word does offer a unique read-only mode that makes it easier for you to see, read, and navigate through all the pages in your document. This read-only mode also allows you to view all the changes made by the different authors that have worked on a document if you have Word’s track changes feature turned on. Speaking of track changes, there’s always the question as to how well Word’s track changes feature works and how well documents shared between Mac and Windows versions retain formatting and paragraph styles. While I wasn’t able to do any extensive cross-platform testing, in the limited testing I was able to do, I did not have any issues with formatting, paragraph styles, tables, or images added to documents. You may run into issues if the fonts you have available on one computer are not available on the other computer. With regard to change tracking (again with limited testing), the only complaint I have is Word 2011 still does not track changes made to images that you add to your documents. In benchmark tests performed by Macworld Lab, Word 2011 was much faster than Word 2008 at opening a file; in our Scroll and Save File test, the times were closer. We'll have more benchmark results in an upcoming lab report. Results are in seconds. Lower results are better and are in bold. After years of lamenting what Word for Mac lacks, I find myself in the odd yet enviable position of announcing that Word 2011 is great. It is a solid word processing application that is powerful and well designed, and makes it easy to find all the features you need. But what’s most important is that it’s designed to move your Mac into your office with no regrets, no compromises, and no excuses for why your Mac can’t play well with the Windows version of the same application.